Guinea Pigs Agility Obstacle Courses, A-Frames, Tunnels, Fence Jumps, Hoop Jumps, Tire Jumps, Weave Polls, and other Agility Equipment Pieces just like dogs and ratties and hamsters and mice and gerbils and many other types of animals.....and at our house, even goats. You might call it Agility, an Obstacle Course, Show Jumping, Showjumping, Hopping, Jump, Jumping, Steeplechase, Steele Chase or any other name you want,it is really much the same sport. An animal trained for a course where they manipulate over, under around and through obstacles. PLEASE NOTE! 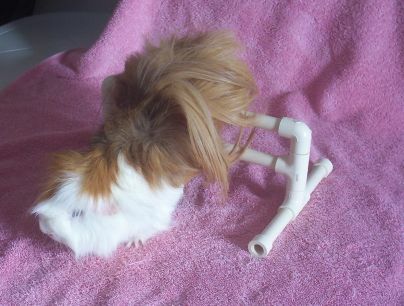 : Guinea Pigs or Cavy/Cavies, will need wide, low and stable pieces of Agility Equipment. They do not have the same mobility as a dog or pet rat. 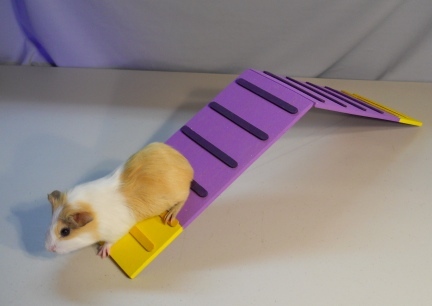 They move more like a hamster as they maneuver the Agility Course. 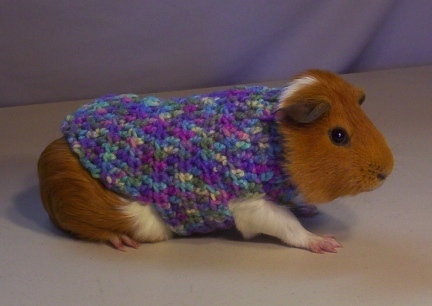 Grab your Guinea Pig, also known as Cavy, Cavies, GP, GPs, and read this. It is fun and easy for both the animals and their people. Surprise your friends and family by showing off the Agility Course your GP can run. Guinea Pigs can learn much more then the average person gives them credit for. This is a short video of one of our Guinea Pigs, Matey, running an Agility Course of Jumps, Teeter Totter, Open Tunnel, and Weave Polls (Easter Eggs). Matey is preforming simple tricks and working on complicated Tricks as well as Coming When Called. I had only been working with him for less then 3 weeks when this was filmed. No. No one had worked with him before I started. You can see more videos on the Guinea Pig Video Page. We hope to be adding more videos soon. How did I get started with Guinea Pig Agility? Deron and I are both animal lovers and trainers. We own many types of animals. When I told Deron back in 2002 that I wanted to train a Pet Fancy Rat to run an Agility course, out came the pencil and paper so that we could figure out how small to make the equipment to be the correct size. He calculated and came up with what I think is adorable replicas of what one might use for Dog Agility. Shortly after that he was building me Rabbit Agility Equipment. I made my own Hamster, Gerbil and Mouse Equipment, but when I started the GPs, Deron was building again. He had already built my Dog Agility Equipment and since then Agility Equipment for our Goats (see our sister sites at the left under the Navigation). Most Guinea Pigs, all that I have worked with, really enjoy the attention and treats that the Agility Course brings. I have had a few that would jump the jumps when they (GPs) were set on the table, before any cues were given. 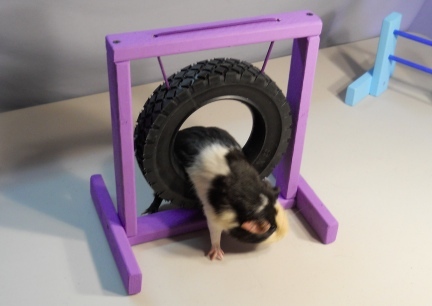 So I would venture to say that they also enjoy the fun that the Agility Equipment brings to their lives. 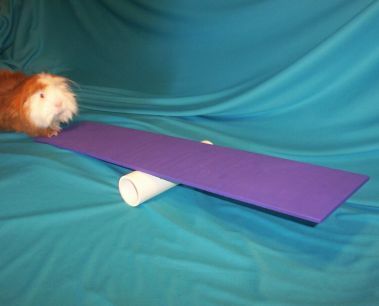 How Can You Get Started with Guinea Pig Agility? It is not Rocket Science. For fun at home you already have items to use as Agility Equipment...an empty oatmeal box for an Open Tunnel, an embroidery hoop for teaching the Hoop and Tire Jump, or, cut away the inside of the plastic on the lid from the oatmeal box. You might use a large/thick hardback book for a Dog Walk, an over turned square shaped canned fruit jar for a Jump. You get the idea. I did set up a page about Getting Started with your Guinea Pig and Frequently Asked Questions also. Looking For Guinea Pig Agility Competition? You might be the first one in your area to own a Guinea Pig trained to run an Agility Course, so you might have to "gather" your own competition and or start a club in your area. 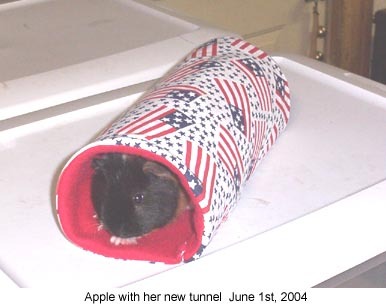 I bet if there are other Guinea Pig owners in your area, they would be interested in learning more about Guinea Pig Agility. You might want to start a group. I did this in WI by just setting a date at a park and inviting friends that had rabbits and ratties to join me there for the fun. I took the Agility Equipment I had for each species and we had a ball. We met twice a month at a local park to work with our animals. We ate out, dutch treat, after the event. Some evenings we had as many as 14 people that participated. You might also want to invite people with other types of small pets to join you. When Deron and I set up the events at our local park, we invited folks with Rabbits first then added ratties. It was not long before the Rabbit owners, that did not already, bought and also trained ratties. You might also contact your local Extensions, 4H and Rabbit Clubs. They might be excited to hear about this sport and you might find that they will know of people you can contact either with information on Guinea Pig Agility or people that would love to work with you to grow the sport in your area. They might also ask if you would put on a Guinea Pig Agility Demonstration at the next County Fair. Looking For Guinea Pig Agility Equipment? 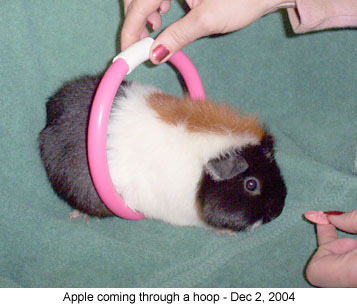 You do need the correct size Agility Equipment that has the stability to hold your Guinea Pig's body weight. And, no. They do not sell these items at your local Discount or Pet Store. 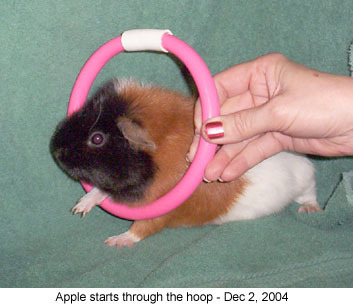 There are some items you can use from around your home to get started training your Guinea Pig, check our Getting Started page here at this site. 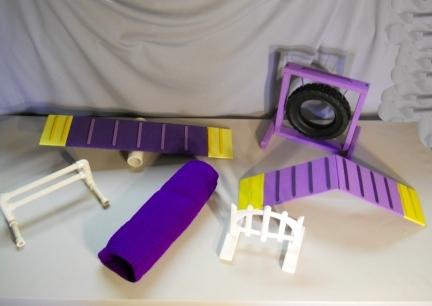 We are in the process of adding more items to our Guinea Pig Agility Equipment Pieces for sale here in our on line store. 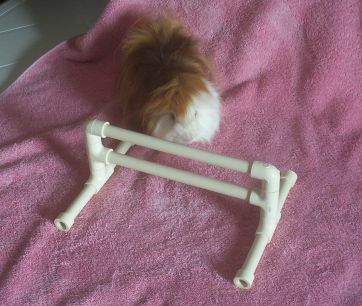 We have created our own Guinea Pig Agility Equipment first for our own Guinea Pigs then other's have asked us to make the items to sell, so we have/are. These pieces are hand crafted, from start to finish, in our NW SD USA home. 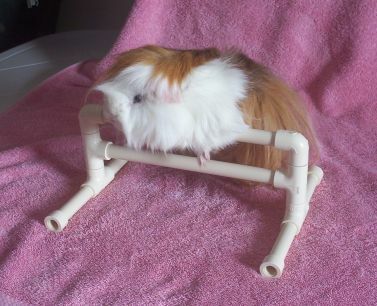 The photos below are some of the Guinea Pigs that we first worked with on Agility Equipment. This is also the reason I tell people over and over, get photos of your animals, take many, take photos of them doing their tricks and agility courses. Small animals live short lives, when they are gone so are the opportunities to take those photos you will adore later. I have too few photos of our animals. 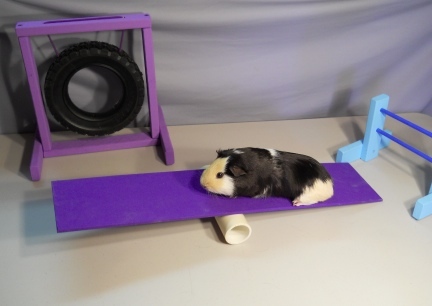 I certainly have too few, some never taken, of Guinea Pigs enjoying the little Agility Courses we had set up. I have this love/hate relationship with the camera. I love to see our animal's photos, my photos? Not so much. Let's face it, we do not usually dress up when working our animals. Our hair is not at it's best either. And why is it my rear end is always the focus of the camera when we get the best shot of the animal? But seriously, I have learned. Try, try and try again to get at least a few photos of the animals you own and love. Compared to our human longevity, their lives are very short. You will be so very sorry one day if you do not get at least one or two photos of your Guinea Pigs on the Agility Equipment, I speak from experiences of that disappointment. 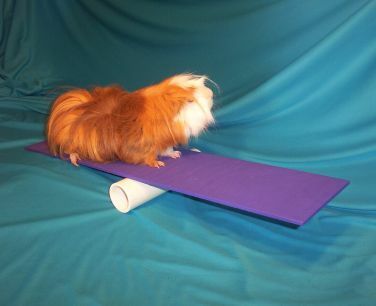 The contents of this page for Guinea Pig Agility is a work in progress, PLEASE check back often. More Photos coming very soon!! THESE ARE YAHOO LIST WE HOST THAT YOU MIGHT ENJOY JOINING. COME TELL US ABOUT YOUR GUINEA PIG AND OR ASK QUESTIONS OR JUST BRAG ON THEIR TRAINING. Many people that own GPs also own Rabbits, so included the rabbit lists we host also. We hope you will join us.